Not to be confused with University of Antelope Valley. Antelope Valley College (AVC) is a community college in Lancaster, California. It is part of the 112-campus California Community College system. It is operated by the Antelope Valley Community College District, with a primary service area of 1,945 square miles (5,040 km2) covering portions of Los Angeles and Kern counties. Instruction is offered at several sites, including Palmdale and Lancaster, and through online and instructional television courses. The college offers Associate in Arts/Associate in Science (two-year) degrees in 71 fields, as well as certificate programs in 59 vocational areas. 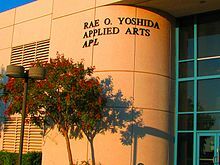 The main campus in Lancaster hosts the satellite location of California State University, Bakersfield-Antelope Valley (CSUB-AV), where students can obtain bachelor's and master's degrees in select subjects. The institution began classes on September 10, 1929, as a department of Antelope Valley High School in Lancaster. It was established as Antelope Valley Junior College, providing the first two years of a college education for those living in what was then a remote, rural area. The name was later modified to Antelope Valley College to reflect it comprehensive nature. The average daily attendance at the college was 13 during the 1929-30 school year. There was little growth in enrollment at the college during the depression years that followed. Alfalfa farmers in Antelope Valley were hard hit during the 1930s, and the smallest junior college in California suffered serious financial difficulties. Teachers took a 20 percent cut in salaries, which ranged from a state-mandated minimum of $1,350 a year to a $1,595 maximum. Average daily attendance (ADA) at the college reached 100 by 1939, but with World War II, attendance plummeted. Attendance reached a low of 13 during the war, the same ADA as the year the school was founded. There were pressures to close the junior college, but trustees and staff held out until veterans returned from the war. Enrollment grew steadily during the postwar years, partly because of the GI Bill of Rights and partly because Antelope Valley began developing an aircraft industry. In 1959, groundbreaking was held for a new college campus on 110 acres (45 ha) at Avenue K and 30th Street West, designed by the architect Henry L. Gogerty (1894-1990). The college campus has expanded to approximately 135 acres (55 ha) through land purchases. Antelope Valley College competes in the California Community College Athletic Association. Antelope Valley College has grown to a student population of approximately 16,000. It is the largest and primary source of higher education in the region. The college maintains a temporary leased site in the City of Palmdale, which serves nearly 2,000 students. Plans call for creation of a full campus on 60 acres (24 ha) of land in southern Palmdale on 25th Street East, south of Avenue S. College officials are working toward a sustainable enrollment of 1,000 full-time equivalent students to qualify Palmdale for center status—a key step in developing a permanent campus. Officials in April 2009 expressed their intent to submit an initial project proposal for a campus to the state in June 2010. Antelope Valley College is accredited by the Accrediting Commission for Community and Junior Colleges of the Western Association of Schools and Colleges. Among the many programs offered through the college are an associate degree program in registered nursing approved by the Board of Registered Nursing, an airframe and powerplant technician program certified by the Federal Aviation Administration, and a lower division engineering program that co-ordinates with an engineering degree program offered locally through California State University, Long Beach. Other programs include aircraft fabrication and assembly (including composite materials), computer graphics, respiratory therapy, Firefighter I Academy and wildland fire technology. In conjunction with the Los Angeles County Sheriff's Department, the Lancaster campus hosts the Sheriff's Training Academy, which meets the requirements of the Peace Officer Standards and Training for training members of the sheriff's department and other law enforcement agencies. The community college district is governed by a locally elected Board of Trustees consisting of five members serving four-year terms, plus a student trustee elected annually by members of the student body. Kevin Appier, former MLB pitcher for the Kansas City Royals and Anaheim Angels. Jim Bruske, former MLB pitcher, Los Angeles Dodgers and San Diego Padres, among others. Brodus Clay, former WWE wrestler, later wrestled in TNA as Tyrus. DeAndra Cobb, former running back, Hamilton Tiger-Cats, Canadian Football League. Dave Cox, California State Senator, 1st District. Kevin Curtis, founder and chief technology officer, InPhase Technologies. Dewayne Dedmon, professional basketball player. Larry S. Dickenson, senior vice president, The Boeing Company. Frank Jackson, Associate Justice, Court of Appeal, Second Appellate District. James C. Ledford Jr., mayor, City of Palmdale, California. Rex Parris, attorney and mayor, City of Lancaster, California. Tony Reed, former running back, Kansas City Chiefs, Denver Broncos. Isaiah Rider, former professional basketball player. Kay Ryan, Poet Laureate, Library of Congress, July 2008 – 2010. Jim Slaton, former Milwaukee Brewers pitcher, bullpen coach, Seattle Mariners, current pitching coach of the Los Angeles Dodgers AAA affiliate Albuquerque Isotopes. ^ California, State of. "California Community Colleges Chancellor's Office - Data Mart". datamart.cccco.edu. Retrieved 1 October 2017. ^ "PCAD - the Pacific Coast Architecture Database - Home". digital.lib.washington.edu. Retrieved 1 October 2017. ^ "Bachelor of Science in Engineering Degree Completion Program". Ccpe.csulb.edu. Retrieved 1 October 2017.